At the lowest level is your application, as our smallest - atomic - unit. Typically, we deal with individual applications running with container isolation. Nothing much changes in our picture so far. 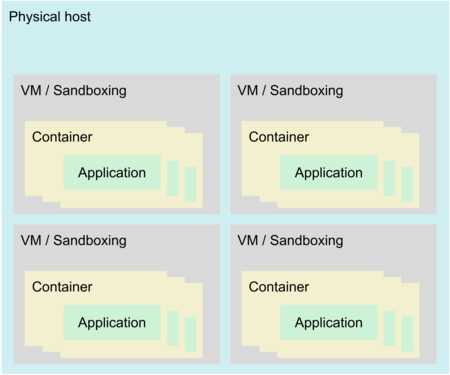 To run workloads in parallel, operators may opt to put a number of containers into a sandbox, most commonly a virtual machine. Virtualization, apart from isolation, also abstracts from the hardware level, easing maintenance operations. Some implementations skip this virtualization layer - we’ll look at the implications (not necessarily negative) further below. IaaS operators aim to consolidate their physical hardware, so bare metal hosts are filled with a number of sandboxes to saturate CPU and I/O. While sandboxing traditionally isolates containers from traditional attacks that exploit flaws in applications’ implementations, the underlying physical host’s CPU introduces new attack vectors. Now that we have a mental model of our target environment, let’s consider the actual class of attacks we’re dealing with. Spectre, Meltdown et al. are a new category of security vulnerabilities that exploit side effects of CPU optimizations for code execution and data access. Those optimizations—speculative execution of instructions—were originally meant to run hidden, without any user-visible impact on CPU execution states. In 2018, the general public learned that there are indeed observable side effects, exploitable by priming a CPU’s speculative execution engine. This creates a side channel for the attacker to draw conclusions on the victim’s workload and data. While we will only briefly discuss the attacks, Jon Masters’ presentation and slides on Spectre/Meltdown provide an excellent and thorough introduction. // into cache by “shadow”. This will reveal “secret_data”. The Spectre family of attacks—which includes Meltdown, discussed below—allow an unprivileged attacker to access privileged memory through speculative execution. Privileged memory may be OS (kernel) memory of its own process context, or private memory belonging to another application, container, or VM. The attack works by first training the branch predictor of a core to predict that specific branches are likely to be taken. A branch in this case is a program flow decision that grants or denies execution of sensitive code based on a value provided by the attacker—for instance, checking if an offset is within a legally accessible memory range. Branch predictor priming is achieved by performing a number of “legal” requests using valid offsets, until the branch predictor has learned that this branch usually enters the sensitive code. Then, the attacker attempts an illegal access as outlined above which will be denied. ut at that point, the speculative execution engine will have executed the access, using an illegal offset, and contrary to its design goal can be forced to leave an observable trace in the core’s cache. The sensitive code is speculatively executed because the branch predictor has seen that branch go into the sensitive code so many times before. But we cannot access the cache, so what gives? The attacker’s code, while incapable of accessing the privileged data directly, may use it in a follow-up load operation, e.g. as an offset to load data from valid memory. Both reading the privileged data (I) and accessing a place in the attacker’s valid memory range using that privileged data as an offset (II) will be speculatively executed. After the illegal access has been denied, the attacker checks which memory offset from (II) is now cached. This will reveal the offset originating from (I), which reveals the privileged data. Spectre v2 builds on the fact that for indirect branches the branch predictor uses the branch target’s memory addresses to keep track of probabilities for indirect branches, and that it uses the virtual addresses of branch targets. The attacker can thus train the branch predictor to speculatively execute whatever is desired by crafting an environment that’s reasonably similar to the victim code in the attacker’s own virtual address space. This means the attacker can prime the branch predictor without ever calling the actual victim code. Only after priming is finished will the victim code be called, following a scheme similar to v1 to extract information. This lowers the restrictions of Spectre v1 with regard to exploitable victim code and makes the Spectre attack more generic and flexible. SPOILER, a recently disclosed attack, makes extended use of speculative read and write implementations and the fact that only parts of the actual virtual memory address are being used by the speculative load/store engine. The engine would consider two different addresses to be the same because it does not consider the whole of the address, leading to false positives in dependency hazard detection. SPOILER leverages this to probe the virtual address space, ultimately enabling user space applications to learn about their virtual->physical address mapping. Since the advent of ROWHAMMER, which lets attackers flip DRAM memory bits by aggressively writing patterns in neighboring memory rows, virt->phys mappings are considered security sensitive. Consequently, SPOILER, after learning about its address mapping, applies ROWHAMMER and can this way change memory contents without accessing it. // into cache by “shadow”. This will reveal secret_data. The Meltdown attack is based on lazy exception checking in the implementation of speculative execution in most Intel CPUs since 2008 (newer series initially released in 2019 and newer should work around this issue), as well as some implementations of ARM CPUs. When speculatively executing code, exceptions are not generated at all (making the speculative execution engine more lightweight). Instead, the exception check only happens at speculation retirement time, i.e. when the speculation meets reality and is either accepted or discarded. With Meltdown—and contrary to Spectre v1 and v2—an attacker can craft their own code to access privileged memory (e.g. kernel space) directly, without requiring a suitable privileged function (“gadget”) to exist on the victim’s side. L1TF once more leverages a CPU implementation detail of the speculative execution engine and also does not rely on branch prediction, so it is pretty similar to Meltdown. It works across memory boundaries and it bypasses virtualization. In fact, an L1TF attack is most powerful when attacking a bare metal host from within a virtual machine of which the attacker controls the kernel. The most basic L1TF attack would have an attacker’s application allocate memory, then wait for the memory pages to be swapped to disk—which will have the kernel’s memory management flip the “invalid” bit in the respective page’s control structure. The “invalid” bit in those control structures—which are shared between the kernel and the CPU’s hardware memory management unit—should cause two things: the page table entry being ignored by the CPU, and the kernel fetching data from disk back into physical memory if the page is accessed. However, in some implementations of speculative execution (most Intel CPUs from 2008 - 2018), the “invalid” bit is ignored. When the attacker now reads from memory on that swapped-out page, the speculative execution engine will access actual memory content of a different process, or of the kernel (the content that replaced the attacker’s page after it was swapped to disk), and the attacker can easily retrieve those values by using it as an offset for an operation on their own (not swapped) memory, and then measuring access timings to figure out which value was cached. While this attack is reasonably difficult to mount from an application—the attacker has no control of either the page addresses or when/if the pages are swapped out—it becomes all the worse when mounted from inside a VM. Inside a (otherwise unprivileged) VM controlled by an attacker, the VM may leverage a CPU mechanism called Extended Page Tables (EPT). EPT allows hosts to share memory management work with guests. This results in a significant performance boost for the virtual memory management, while allowing an attacker to craft suitable page table entries and mark those invalid directly, bypassing the restrictions of the basic attack described above. A malicious VM exploiting L1TF would be able to read all of its physical host’s memory, including the memory of other guests, with relative ease. After refreshing our memory on the mechanisms exploited to leak information via otherwise perfectly reasonable optimizations, we’ll go ahead and see how we can apply these attacks to the generic container stack we’ve built in the introduction (which, if you just worked your way through the attack details, must feel like ages ago). This applies to a scenario where containers are run on bare metal, on a container-centric OS. The OS provides APIs and primitives for deploying, launching, managing, and tearing down containerized applications. Potential victims leaking information to a rogue application would be its own container control plane, the OS part of its process context, and other containers running on the same host. In order to ensure confidentiality, the container OS is required to ship with the latest security patches, and compiled with Retpoline enabled (a kernel build time option). Furthermore, it would need to have run-time mitigations enabled - IBRS, both (kernel+user space) for Spectre v2, page table isolation (PTI) for Meltdown, store bypass disable (kernel+user space) for Spectre v4, and Page Table Entry Inversion (PTE Inversion) for L1TF. IBRS is a bit Intel introduced to the machine specific register set of their CPUs. Security-focused Linux container OSs like Flatcar Linux enable such measures by default. In order to further secure the container control plane from being spied on by its own application, the control plane and accompanying libraries need to be compiled in a way that emits protective instructions around potential Spectre gadgets (e.g. -mindirect-branch=thunk, -mindirect-branch-register, -mfunction-return=thunk for gcc). Virtualization environments suffer from an additional vector of attack that makes it significantly easier for the attacker to craft page mappings that exploit L1TF, if the attacker is able to gain control of the guest kernel. We classify virtualization environment in two categories. Restricted virtualization environments, while providing virtualization services to container clusters, restrict access of the virtualization guest - unprivileged users are used for running workloads, and the guest OS kernel cannot be changed by a third party. This approach requires that the operator remains in full control over both VMs and VM guest kernels at any point in time. Appropriate monitoring needs to be in place to ensure that a malicious application does not break out of its unprivileged container and subsequently receives access rights to mutate kernel code. e.g. by loading custom kernel modules or even booting into a custom kernel. This would ultimately allow attackers to work around the PTE inversion restriction in particular, but with significant security impact. With full control over VM and instance kernels, the Operating System level mitigations discussed in the previous section will secure the stack. Unrestricted virtualization environments, even when not “officially” allowing for custom kernels, provide root access to 3rd parties and therefore are at risk of mutating changes to the kernel anyway, such as rogue module loads, or even booting a custom kernel. This will allow an attacker to craft custom page table entries, greatly enhancing the impact of the L1TF attack in particular. From here on, working around those hardware vulnerabilities will hurt performance. Before we discuss mitigations for a scenario where we don’t control the guest kernel, let’s have a look at our options for securing control even in privileged environments. This mitigation ensures that the VM kernel cannot be modified—e.g. through loading a kmod—or otherwise mutated, even with VM root access available. A technical way to hide access to the VM kernel provided by some virtualization systems (most notably qemu) is to use direct kernel boot—that is, starting the guest with a kernel that is not on the VM filesystem image, but present on the bare metal virtualization host and is provided to the hypervisor when a VM is started. Since VMs do not have access to host file systems, the VM kernel cannot be modified even if VM root access is available. This approach would require the operator to provide and to maintain custom Linux kernel builds tailored for their infrastructure. Kernel module signing may be leveraged to guarantee “legal” kernel modules can still be loaded. Security in this scenario may be supported by operationalising direct kernel boot with the virtualization stack—i.e. booting the VM into a kernel supplied on the bare metal host instead of from the instance’s file system image, locking down loading of modules (monolithic kernel, or kmod signing), and removing kexec support. Security focused distributions like Flatcar Linux are working towards enabling locked-down kernel configurations like the above. With the guest kernel remaining firmly under the control of the operator, Operating System level mitigations like PTE inversion (which cannot be worked around from inside the VM’s user space) will once more secure the system. In order to have VMs of varying trust levels continue to share the same physical host, we might investigate ensuring that VMs never share the same L1 cache. The technical way to achieve this is vCPU -> pCPU pinning. In this scenario, virtualization workloads must not be CPU over-committed - one virtual CPU equals one physical CPU, and each physical CPU serves the same VM. Application level over-commitment, i.e. running more applications (or containers) inside of a VM than there are CPUs, may be applied to saturate system usage. Alternatively, VMs may be grouped by trust level, and the virtual cores of VMs of the same trust level may be pinned to the same group of physical CPUs. When the guest kernel cannot be controlled and we therefore need to anticipate attacks from the VM kernel, we need to secure the physical host’s OS as well as other VMs running on the same host. L1TF attacks mounted from VM kernels have significantly higher impact than malicious user space applications trying to leverage L1TF. Specific hardware acceleration in a CPU’s memory management unit—EPT from above—allows guests to manage its page tables directly, bypassing the host kernel. EPT, while providing a significant speed-up to VM memory management, poses a potential security risk for the bare metal host’s OS, as page table entries suitable for exploiting L1TF can be crafted directly. 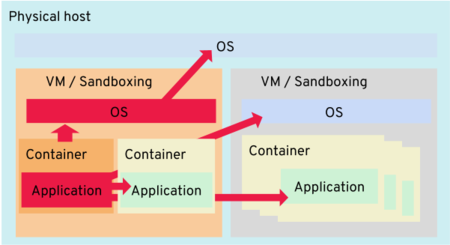 First, we need to take a step back though and reconsider sandboxing as in this scenario containers in the same VM cannot be considered isolated anymore. Isolation now happens solely at the VM level, implying that only containers of the same trust level may share a VM—which is likely to cause repercussions on a clusters’ hardware saturation and maintenance operations. With CPU pinning, a host’s CPUs are statically partitioned into “VM slots”, and there’s a maximum number of VMs that can run on a host to ensure CPUs are never shared between VMs (or between trust levels). CPU pinning allows guest OS kernels to be in control of 3rd parties without impacting the security of other VMs running on the same physical host. To further secure the operating system of the physical host, which may also leak information via the L1 data cache when the VM task-switches into the physical host’s kernel via a hypercall, the L1 data cache needs to be flushed before the VM context is entered from the host OS. KVM provides a module parameter / sysctl that will flush caches, via the kvm-intel.vmentry_l1d_flush option (l1d for level-1 data cache). The option can be set to either “always” or “cond” (it can also be deactivated by supplying “never”). “always” will flush the L1 data cache every time a VM is scheduled off a CPU, while “cond” will try to figure out whether a vulnerable code path was executed and only flush if required. This option will impact application performance as the L1D cache will need refilling after each schedule event, which it otherwise would not—but since refilling will happen from the L2 cache, the overall performance impact is expected to be mild. Secure L1 cache data of VMs that are becoming inactive from the next VM that’s to use the same physical CPU, or by the host OS (see above). To mitigate 1., either the Hyperthreading or the EPT CPU feature needs to be disabled on the physical virtualization host. While the performance impact is application specific, overall performance gains published at the time the respective technology was introduced suggest it may be less painful to disable Hyperthreading over deactivating EPT. In any case, operators should monitor the impact on their real-life workloads, and experiment with changing mitigations to determine the least painful measure. In order to prevent data leaks via the L1 cache after a VM was scheduled off a pCPU, the L1 cache must be flushed before the next VM starts using that pCPU, similar to the physical OS protection discussed in the previous section. The same mechanism via KVM’s kvm-intel.vmentry_l1d_flush option applies here. Caches and Hyperthreading in particular has been under sustained attack from this new generation of hardware-level information disclosures, with security researchers warning about potential inherent vulnerabilities, and e.g. the OpenBSD distribution disabling Hyperthreading completely for security reasons. However, even when factoring in the vulnerability drawbacks, valid use-cases for hyperthreading remain. For example, a multi-threaded application, which does share its memory with its threads anay, would benefit without being vulnerable per se. However, currently no scheduler exists in the Linux kernel that is advanced enough to perform this level of scheduling—appointing sets of processes or threads to a set of cores or hyperthreads of the same core, while locking out all other processes from those cores. But something is in the works. A patch-set of no less than 60 individual patches proposed to the Linux kernel’s CFQ scheduler in September 2018 started a discussion about adding co-scheduling capabilities to Linux. While this particular patch-set appears to have been abandoned (with the discussion apparently concluded), the general direction of this work continues to be pursued. More recently the maintainer of the Linux scheduler subsystem, Peter Zijlstra, proposed his own patch series to tackle this feature. Last week, a high severity vulnerability was disclosed by the maintainers of runc, under the name CVE-2019-5736: runc container breakout. This vulnerability has high severity (CVSS score 7.2) because it allows a malicious container to overwrite the host runc binary and gain root privileges on the host. According to our research, however, when using Flatcar Linux with its read-only filesystems this vulnerability is not exploitable. In the context of our security work, we had been asked to evaluate the report’s severity with respect to the client’s installation. In the course of this evaluation, we wrote an exploit in order to understand how it works and to test if their installation was vulnerable. While we did recognize the severity of the issue, we also ascertained that the client was not affected. To understand this, let’s take a look at how things should work versus what could happen if the exploit was successfully executed. Let’s first look at the following diagram showing how runc should work. runc forks a new process that becomes the pid1 of the container. Following the traditional fork/exec Unix model, that process is so far only a copy of the parent process and therefore still runs the “runc” program. /proc/self/exe points to runc while running in the container. Then, pid1 will execute the entrypoint in the container, meaning the program running will be substituted to the program in the container. Instead of executing our own program in the container, we set the entrypoint to /proc/self/exe, meaning runc will run runc again. So /proc/1/exe will be a reference to runc for a longer time. However, we don’t want to run the runc code. With LD_PRELOAD, we will execute a routine that will sleep for a few seconds in order to keep the reference /proc/1/exe for the next step. During those few seconds, we have enough time to enter the container with runc exec and open a reference to /proc/1/exe, while it is still pointing to runc (file descriptor 10 in our exploit). At this point, we cannot open runc in read-write mode because pid1 is still running runc. We would get the error “text busy” if we tried. The sleep in pid1 terminates and executes something else (another sleep but via /bin/sh so pid1 does not lock runc). Finally, we have a temporary read-only file descriptor to the runc binary on the host filesystem and we use tee /proc/self/fd/10 to acquire a new file descriptor in write mode and to overwrite the runc binary. "exec 10< /proc/1/exe ; "
"echo Lookup inode of /proc/1/exe: ; "
"stat -L --format=%i /proc/1/exe ; "
"echo sleep 4 ; "
"printf '#!/bin/sh\\ncp /etc/shadow /home/ubuntu/\\nchmod 444 /home/ubuntu/shadow\\n' | tee /proc/self/fd/10 > /dev/null ; "
This program is a single function compiled into foo.so, loaded via the environment variable $LD_PRELOAD. It will be executed both as the initial process in the container (pid 1) and whenever entering in the container with docker exec. If it’s running as pid 1 (if (pid == 1)), it will run the red part of the diagram above. If it’s running via docker enter, it will run the bottom part of the diagram above. When trying this on Ubuntu, we can overwrite runc on the host. When executing the exploit, /usr/bin/docker-runc is overwritten by the malicious script that copies the password file /etc/shadow from the host, making it available for others to read. Then, we tried the same exploit on Flatcar Linux and we couldn’t reach the same result. Flatcar Linux mounts /usr in read-only mode, protecting most programs from being overwritten. However, this test does not use runc from /usr/bin/runc but from /run/torcx/unpack/docker/bin/runc (managed by torcx). But torcx also uses a read-only mount for the programs, so it is protected the same way. As we have demonstrated, the read-only filesystems feature of Flatcar Linux is capable of mitigating this runc vulnerability. It can also help against similar exploits of this class. In addition, Flatcar Linux delivers updates automatically, including security fixes. These are some of the reasons we are pushing Flatcar Linux forward and using it as the base for our upcoming open source products. If you want to learn more about Flatcar Linux, head over to flatcar-linux.org. If you need help with security assessments, penetration testing, or engineering services contact us at [email protected]. In summer 2018, the Gardener project team asked Kinvolk to execute several penetration tests in its role as a third-party contractor. We applied our Kubernetes expertise to identify vulnerabilities on Gardener installations and to make recommendations. Some of our findings are now presented in this article on the Gardener website. We presented some of our findings in a joint presentation with SAP entitled Hardening Multi-Cloud Kubernetes Clusters as a Service at KubeCon 2018 in Shanghai. The slides in PDF and the video recording are now available. We also presented it at the Gardener Bi-weekly Meeting, see the agenda for Friday 7 Dec 2018. If you need help with penetration testing your installation, please contact us at [email protected]. A few weeks ago we announced Flatcar Linux, our effort to create a commercially supported fork of CoreOS’ container Linux. You can find the reasoning for the fork in our FAQ. Since then we’ve been testing, improving our build process, establishing security procedures, and talking to testers about their experiences. We are now satisfied that Flatcar Linux is a stable and reliable container operating system that can be used in production clusters. Thus, today we are ready to open Flatcar Linux to the public. Thanks to our testers for testing and providing feedback. We look forward to more feedback and community feedback now that Flatcar is more widely available. For information about release and signing keys, please see the new Releases and the image signing key pages. You can use the Flatcar repository to file any issue or feature request you may have. We are also happy to announce the initial release of our Flatcar Documentation. You can find information about installing and running Flatcar there. In the coming weeks we will be providing details of commercial support for Flatcar Linux. Please contact [email protected] if you are interested in commercial support. We’ve created a mailing list and IRC channels to facilitate communications between users and developers of Flatcar Linux. Please join those to talk about Flatcar Linux and discuss any issues or ideas you have. We look forward to hearing from you there! The Kinvolk team will be on hand at Kubecon EU to discuss Flatcar Linux. Come by booth SU-C23 and say “Hi!”. Flatcar Linux would not exist without Container Linux. Thanks to the CoreOS team for building it and we look forward to continued cooperation with their team. Please follow Kinvolk and the Flatcar Linux project on twitter to stay informed about commercial support and other Flatcar Linux updates in the coming weeks and months. Once upon a time, software was built and installed with the classic triptych ./configure, make, make install. The build part with make didn’t need to be run as root, which was, in fact, discouraged. Later, software started being distributed through package managers and built with rpm or dpkg-buildpackage. Building packages as root was still unnecessary and discouraged. Since rpm or deb packages are just archive files, there shouldn’t be any need for privileged operations to build them. After all, we don’t need the ability to load a kernel module or reconfigure the network to create an archive file. Why should we avoid building software as root? First, to avoid potential collateral damage to the developer’s machine. Second, to avoid being compromised by potentially untrusted resources. This is especially important for build services where anyone can submit a build job: the administrators of the build service have to protect their services against potentially malicious build submissions. Nowadays, more and more software in cloud infrastructure is built and distributed as container images. Whether it is a Docker image, an OCI bundle, ACI or another format, this is not so different from an archive file. And yet, the majority of container images are built via a Dockerfile with the Docker Engine, which, along with most of its operations, mostly runs as root. This makes life difficult for build services that want to offer container builds to users that are not necessarily trusted. How did we dig ourselves into this hole? Why does docker build need root? There are two reasons why docker build needs root: the build command requires root for some images and to setup the build container. Dockerfiles allow executing arbitrary commands inside the container environment that it is building with the “RUN” command. This makes the build very convenient: users can use “apt” on Ubuntu based images to install additional packages and they will not be installed on the host but in the container that is being built. This alone requires root access in the container because “apt” will need to install files in directories that are only writable by root. Preparing an overlay filesystem. This is necessary to keep track of the changes compared to the base image and requires CAP_SYS_ADMIN to mount. Creating new Linux namespaces (sometimes called “unsharing”): mount namespace, pid namespace, etc. All of them (except one, we will see below) require the CAP_SYS_ADMIN capability. pivot_root or chroot, which also require CAP_SYS_ADMIN or CAP_SYS_CHROOT. Mounting basic filesystems like /proc. The “RUN” command can execute arbitrary shell scripts, which often require a properly set up /proc. Preparing basic device nodes like /dev/null, /dev/zero. This is also necessary for a lot of shell scripts. Depending on how they are prepared, this requires either CAP_MKNOD or CAP_SYS_ADMIN. This blog post will focus on some of those operations in detail. This is not an exhaustive list. For example, preparing basic device nodes is not covered in this blog post. There are other projects to build docker containers that aim to be unprivileged. Some want to support builds from a Dockerfile. They could be a building block for CI services or serverless frameworks which need to build a container image for each function. In the same way that other Linux namespaces restrict the visibility of resources to processes inside the namespace, processes in user namespaces only see a subset of all possible users and groups. In the initial user namespace, there are approximately 4294967296 (2^32) possible users. The range goes from 0, for the superuser or root, to 2^32-1. When setting up a user namespace, container runtimes allocate a range of uids and specify a uid mapping. The mapping means that uid 0 (root) in the container could be mapped to uid 100000 on the host. Root being relative means that capabilities are always relative to a specific user namespace. We will come back to that. User namespaces can be nested. The inner namespace will have the same amount (or, usually, fewer) uids than the outer namespace. Not all uids from the outer namespace are mapped, but those which are are mapped in a bijective, one-to-one way. As opposed to all other kinds of Linux namespaces, user namespaces can be created by an unprivileged user (without CAP_SYS_ADMIN). In this case, the uid mapping is restricted to a single uid. In the example below, uid 1000 on the host is mapped to root (uid 0) in the yellow container. Once the new unprivileged user namespace is created, the process inside is root from the point of view of the container and therefore it has CAP_SYS_ADMIN, so it could create other kinds of namespaces. This is a useful building block for our goal of unprivileged container builds. Each Linux namespace instance, no matter what kind (mount, pid, etc. ), has a user namespace owner. It is the user namespace where the process that created it sits. When several kinds of Linux namespaces are created in a single syscall, the newly created user namespace owns the other newly created namespaces. The ownership of those namespaces is important because for most operations, the kernel will check that when determining whether a process has the proper capability. In the example below, a process attempts to perform a pivot_root() syscall. To succeed, it needs to have CAP_SYS_ADMIN in the user namespace that owns the mount namespace where the process is located. In other words, having CAP_SYS_ADMIN in a unprivileged user namespaces does not allow you to “escape” the container and get more privileges outside. The function ns_capable() checks if the current process has the CAP_SYS_ADMIN capability within the user namespace that owns the mount namespace (mnt_ns) where the current process is located (current->nsproxy). What about mounting the new overlayfs? We’ve seen that pivot_root() can be done without privileges by creating a new mount namespace owned by a new unprivileged user namespace. Isn’t this the same for mounting the new overlayfs? Granted, the mount() syscall is guarded by exactly the same call to ns_capable() that we have seen above for pivot_root(). Unfortunately, that’s not enough. New mounts: this mounts a filesystem that was not mounted before. A block device might be provided if the filesystem type requires one (ext4, vfat). Some filesystems don’t need a block device (FUSE, NFS, sysfs). But in any case, the kernel maintains a struct super_block to keep track of options such as read-only. Change options on an existing mount. This can be superblock options, per-mountpoint options or propagation options (most useful when having several mount namespaces). It is allowed in procfs, tmpfs, sysfs, cgroupfs and a few others. It is disallowed in ext4, NFS, FUSE, overlayfs and most of them actually. So mounting a new overlayfs without privileges for container builds seems impossible. At least with upstream Linux kernels: Ubuntu kernels had for some time the ability to do new mounts of overlayfs and FUSE in an unprivileged user namespace by adding the flag FS_USERNS_MOUNT on those 2 filesystem types along with necessary fixes. Kinvolk worked with a client to contribute to the upstreaming effort of the FUSE-part of patches. Once everything is upstream, we will be able to mount overlayfs. The FUSE mount will be upstreamed first, before the overlayfs. At that point, overlayfs could theoretically be re-implemented in userspace with a FUSE driver. As noted above, procfs has the FS_USERNS_MOUNT flag so it is possible to mount it in an unprivileged user namespace. Unfortunately, there are other restrictions which block us in practice in Docker or Kubernetes environments. To explain locked mounts, we’ll first have a look at systemd’s sandboxing features. It has a feature to run services in a different mount namespace so that specific files and directories are read-only (ReadOnlyPaths=) or inaccessible (InaccessiblePaths=). The read-only part is implemented by bind-mounting the file or directory over itself and changing the mountpoint option to read-only. The inaccessible part is done by bind-mounting an empty file or an empty directory on the mountpoint, hiding what was there before. Using bind mounts as a security measure to make files read-only or inaccessible is not unique to systemd: container runtimes do the same. This is only secure as long as the application cannot umount that bind mount or move it away to see what was hidden under it. Both umount and moving a mount away (MS_MOVE) can be done with CAP_SYS_ADMIN, so systemd documentation suggests to not give that capability to a service if such sandboxing features were to be effective. Similarly, Docker and rkt don’t give CAP_SYS_ADMIN by default. We can imagine another way to circumvent bind mounts to see what’s under the mountpoint: using unprivileged user namespaces. Applications don’t need privileges to create a new mount namespace inside a new unprivileged user namespace and then have CAP_SYS_ADMIN there. Once there, what’s preventing the application from removing the mountpoint with CAP_SYS_ADMIN? The answer is that the kernel detects such situations and marks mountpoints inside a mount namespace owned by an unprivileged user namespace as locked (flag MNT_LOCK) if they were created while cloning the mount namespace belonging to a more privileged user namespace. Those cannot be umounted or moved. On the left: the host mount namespace with a /home directory for Alice and Bob. In the middle: a mount namespace for a systemd service that was started with the option “ProtectHome=yes”. /home is masked by a mount, hiding the alice and bob subdirectories. On the right: a mount namespace created by the aforementioned systemd service, inside a unprivileged user namespace, attempting to umount /home in order to see what’s under it. But /home is a locked mount, so it cannot be unmounted there. The explanation about locked mounts is valid for all filesystems, including procfs and sysfs but that’s not the full story. Indeed, in the build container, we normally don’t do a bind mount of procfs but a new mount because we are inside a new pid namespace, so we want a new procfs that reflects that. New mounts are normally independent from each other, so a masked path in a mount would not prevent another new mount: if /home is mounted from /dev/sdb and has masked paths, it should not influence /var/www mounted from /dev/sdc in any way. The capability needed to circumvent the restriction on those files is normally CAP_SYS_ADMIN (for e.g. umount). To prevent a process without CAP_SYS_ADMIN from accessing those masked files by mounting a new procfs mount inside a new unprivileged user namespace and new mount namespace, the kernel uses the function mount_too_revealing() to check that procfs is already fully visible. If not, the new procfs mount is denied. This is blocking us from mounting procfs from within a Kubernetes pod. Avoid mounting procfs in the build environment and update Dockerfiles that depend on it. Using a Kubernetes container with privileges, so that /proc in the Docker container is not covered. A “rawproc” option in Kubernetes is being discussed with the underlying implementation in moby. Changing the kernel to allow a new procfs mount in an unprivileged user namespace, even when the parent proc mount is not fully visible, but with the same masks in the child proc mount. I started this discussion in a RFC patch and there is an alternative proposal by Djalal Harouni to fix procfs more generally. 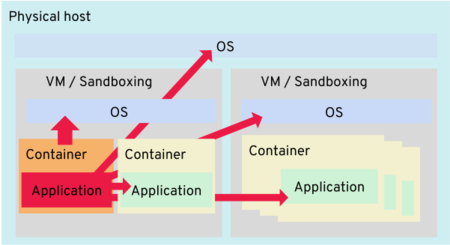 As you can see there are a lot of moving parts, as is the general case with Linux containers. But this is an area where development is quite active at the moment and hope for progress is greater than it has ever been. 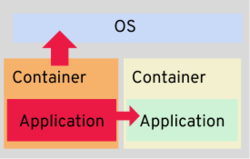 This blog post explored some aspects of the underlying mechanisms on Linux that are being worked on for unprivileged container builds: user namespaces, mounts, some filesystems. We hope to bring you updates about unprivileged container builds in the future and especially about our own involvement in these efforts. 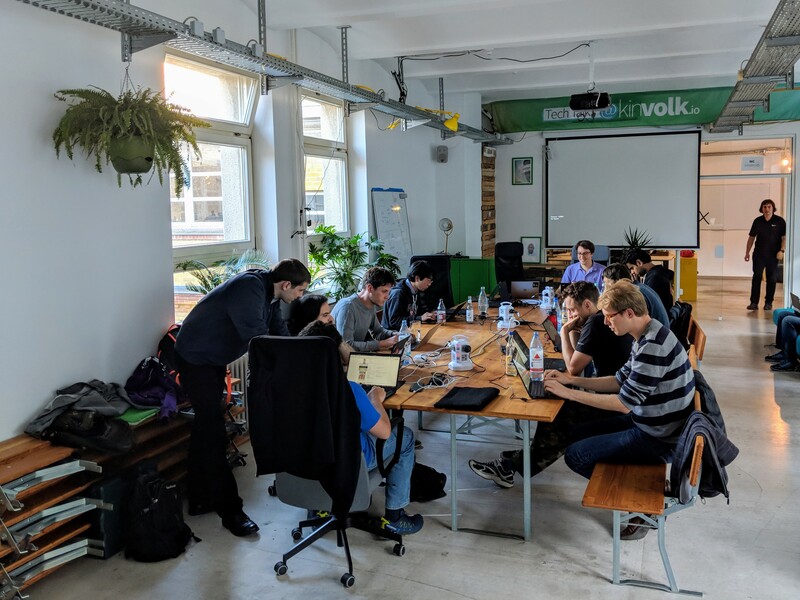 Kinvolk is an engineering team based in Berlin working on Linux, Containers and Kubernetes. We combine our expertise of low-level Linux details like capabilities, user namespaces and the details of FUSE with our expertise of Kubernetes to offer specialised services for your infrastructure that goes all the way down the stack. Contact us at [email protected] to learn more about what Kinvolk does. Join the Kinvolk team at FOSDEM 2018! FOSDEM, the premier European open source event that takes place in Brussels, is right around the corner! Most of the Kinvolk team is heading there for a collaborative weekend, with three of our engineers giving talks. Zeeshan, software engineer at Kinvolk, will give a quick introduction to memory management concepts of Rust, a system of programming language that focuses on safety and performance simultaneously. Iago, technical lead & co-founder at Kinvolk, will be diving into rkt container runtime and its Kubernetes integration, specifically looking at the progress of rkt and rktlet and the Kubernetes CRI implementation of rkt. Alban, CTO and co-founder at Kinvolk, will explore container image distribution with casync, a content-addressable data synchronization tool. We’re looking forward to seeing old friends and making new ones. Follow us on Twitter to see what we are up to at the conference! There’s been a number of changes in kube-spawn kube-spawn since we announced it. The main focus of the recent developments was improving the CLI, supporting several clusters running in parallel, and enabling developers to test Kubernetes patches easily. In addition, we’ve added a bunch of documentation, improved error messages and, of course, fixed a lot of bugs. We’ve completely redesigned the CLI commands used to interact with kube-spawn. You can now use create to generate the cluster environment, and then start to boot and provision the cluster. The convenience up command does the two steps in one so you can quickly get a cluster with only one command. Once a cluster is up and running you can use stop to stop it and keep it there to start it again later, or restart to stop and start the cluster. The command destroy will take a cluster in the stopped or running state and remove it completely, including any disk space the cluster was using. The following diagram provides a visualization of the CLI workflow. Previously, users could only run one cluster at the time. With the flag --cluster-name flag, running multiple clusters in parallel is now possible. All the CLI operations can take --cluster-name to specify which cluster you’re referring to. To see your currently created clusters, a new command list was added to kube-spawn. This is especially useful when you want to test how your app behaves in different Kubernetes versions or, as a Kubernetes developer, when you made a change to Kubernetes itself and want to compare a cluster without changes and another with your change side-by-side. Which leads us to the next feature. kube-spawn makes testing changes to Kubernetes really easy. You just need to build your Hyperkube Docker image with a particular VERSION tag. Once that’s built, you need to start kube-spawn with the --dev flag, and set --hyperkube-tag to the same name you used when building the Hyperkube image. Taking advantage of the aforementioned multi-cluster support, you can build current Kubernetes master, start a cluster with --cluster-name=master, build Kubernetes your patch, and start another cluster with --cluster-name=fix. You’ll now have two clusters to check how your patch behaves in comparison with an unpatched Kubernetes. You can find a detailed step-by-step example of this in kube-spawn’s documentation. We’ve successfully run the Kubernetes Software Conformance Certification tests based on Sonobuoy for Kubernetes v1.7 and v1.8. We’ve submitted the results to CNCF and they merged our PRs. This means kube-spawn is now a certified Kubernetes distribution. 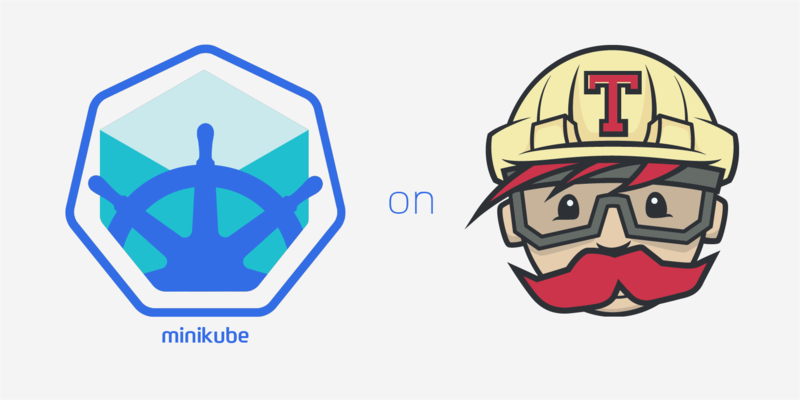 With the above additions, we feel like kube-spawn is one of the best tools for developing on Linux with, and on, Kubernetes. If you want to try it out, we’ve just released kube-spawn v0.2.1. We look forward to your feedback and welcome issues or PRs on the Github project. At Kinvolk, we’ve been working with the Habitat team at Chef to make Habitat-packaged applications run well in Kubernetes. The first step on this journey was the Habitat operator for Kubernetes which my colleague, Lili, already wrote about. The second part of this project —the focus of this post— is to make it easier to deploy Habitat apps to a Kubernetes cluster that is running the Habitat operator. To that end, we’d like to introduce the Habitat Kubernetes exporter. The Kubernetes exporter is an additional command line subcommand to the standard Habitat CLI interface. It leverages the existing Docker image export functionality and, additionally, generates a Kubernetes manifest that can be deployed to a Kubernetes cluster running the Habitat operator. Run hab pkg export kubernetes --help to see the full list of available options and general help. Let’s take a look at the Habitat Kubernetes exporter in action. As you can see, the Habitat Kubernetes exporter helps you to deploy your applications that are built and packaged with Habitat on a Kubernetes cluster by generating the needed manifest files. We’ve got more exciting ideas for making Habitat and Habitat Builder work even more seamlessly with Kubernetes. So stay tuned for more. For the last few months, we’ve been working with the Habitat team at Chef to make Habitat-packaged applications run well in Kubernetes. The result of this collaboration is the Habitat Operator, a Kubernetes controller used to deploy, configure and manage applications packaged with Habitat inside of Kubernetes. This article will give an overview of that work — particularly the issues to address, solutions to those issues, and future work. For the uninitiated, Habitat is a project designed to address building, deploying and running applications. Applications are built from shell scripts known as “plans” which describe how to build the application, and may optionally include configurations files and lifecycle hooks. From the information in the plan, Habitat can create a package of the application. In order to run an application with a container runtime like Docker or rkt, Habitat supports exporting packages to a Docker container image. You can then upload the container image to a registry and use it to deploy applications to a container orchestration system like Kubernetes. Applications packaged with Habitat — hereafter referred to as simply as applications — support the following runtime features. These features are available because all Habitat applications run under a supervisor process called a Supervisor. The Supervisor takes care of restarting, reconfiguring and gracefully terminating services. The Supervisor also allows multiple instances of applications to run with the Supervisor communicating with other Supervisors via a gossip protocol. These can connect to form a ring and establish Service Groups for sharing configuration data and establishing topologies. Many of the features that Habitat provides overlap with features that are provided in Kubernetes. Where there is overlap, the Habitat Operator tries to translate, or defer, to the Kubernetes-native mechanism. One design goal of the Habitat Operator is to allow Kubernetes users to use the Kubernetes CLI without fear that Habitat applications will become out of sync. For example, update strategies are core feature of Kubernetes and should be handled by Kubernetes. For the features that do not overlap — such as topologies and application binding — the Habitat Operator ensures that these work within Kubernetes. One of the fundamental challenges we faced when conforming Habitat to Kubernetes was forming and joining a ring. Habitat uses the --peer flag which is passed an IP address of a previously started Supervisor. But in the Kubernetes world this is not possible as all pods need to be started with the exact same command line flags. In order to be able to do this within Kubernetes, implemented a new flag in Habitat itself, --peer-watch-file. This flag takes a file which should contain a list of one or more IP addresses to the peers in the Service Group it would like to join. Habitat uses this information to form the ring between the Supervisors. This is implemented in the Habitat Operator using a Kubernetes ConfigMap which is mounted into each pod. Habitat allows for drawing configuration information from different sources. One of them is a user.toml file which is used for initial configuration and is not gossiped within the ring. Because there can be sensitive data in configuration files, we use Kubernetes Secrets for all configuration data. The Habitat Operator mounts configuration files in the place where Habitat expects it to be found and the application automatically picks up this configuration as it normally would. This mechanism will also be reused to support configuration updates in the future. One of these is specifying the two different topologies that are supported in Habitat. 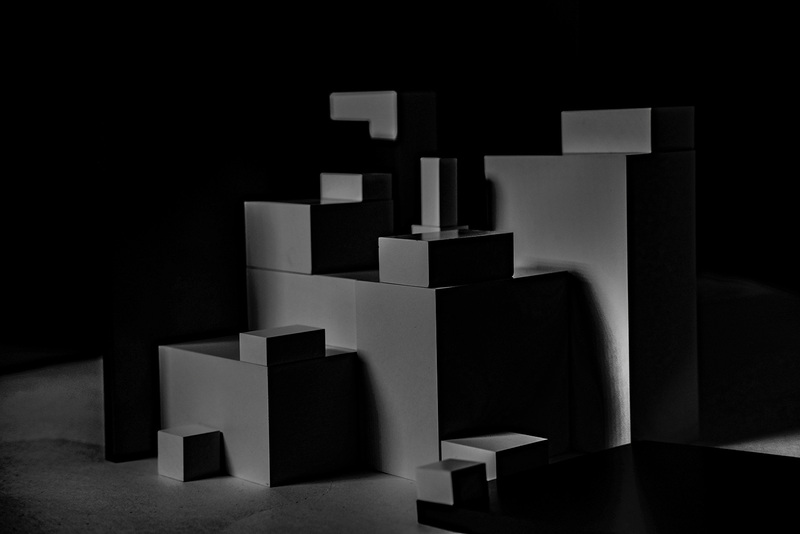 The standalone topology — the default topology in Habitat — is used for applications that are independent of one another. With the leader/follower topology, the Supervisor handles leader election over the ring before the application starts. For this topology, three or more instances of an application must be available for a successful leader election to take place. A security feature of Habitat that we brought into the operator is securing the ring by encrypting all communications across the network. The Habitat Operator is in heavy development and we’re excited about the features that we have planned for the next months. We’ve already started work on a exporter for Kubernetes. This will allow you to export the application you packaged with Habitat to a Docker image along with a generated manifest file that can be used to deploy directly to Kubernetes. As mentioned above, we are planning to extend the initial configuration and use the same logic for configuration updates. This work should be landing in Habitat very soon. With Habitat applications, configuration changes can be made without restarting pods. The behaviour for how to do configuration updates is defined in the applications Habitat plan. We’re also looking into exporting to Helm charts in the near future. This could allow for bringing a large collection of Habitat-packaged to Kubernetes. Another area to explore is integration between the Habitat Builder and Kubernetes. The ability to automatically recompile application, export images, and deploy to Kubernetes when dependencies are updated could bring great benefits to Habitat and Kubernetes users alike. Please take the operator for a spin here. The first release is now available. All you need is an application packaged with Habitat and exported as Docker image, and that functionality is already in Habitat itself. Note: The Habitat operator is compatible with Habitat version 0.36.0 onwards. If you have any questions feel free to ask on the #kubernetes channel in Habitat slack or open an issue on the Habitat operator. 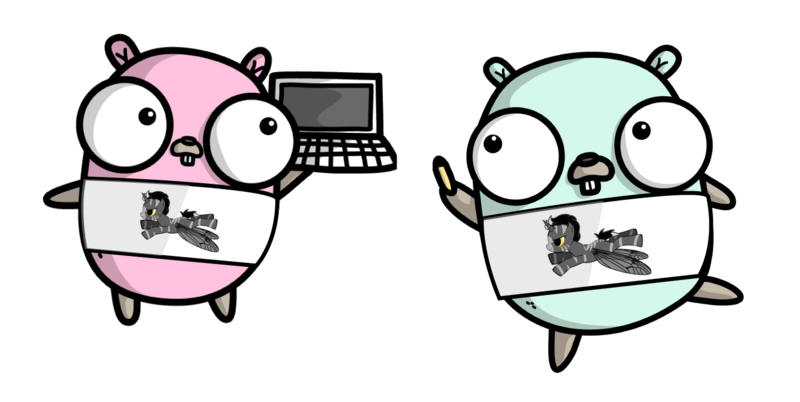 Almost a year ago we introduced gobpf, a Go library to load and use eBPF programs from Go applications. Today we would like to give you a quick update on the changes and features added since then (i.e. the highlights of git log --oneline --no-merges --since="November 30th 2016" master). With commit 869e637, gobpf was split into two subpackages (github.com/iovisor/gobpf/bcc and github.com/iovisor/gobpf/elf) and learned to load BPF programs from ELF object files. This allows users to pre-build their programs with clang/LLVM and its BPF backend as an alternative to using the BPF Compiler Collection. One project where we at Kinvolk used pre-built ELF objects is the TCP tracer that we wrote for Weave Scope. Putting the program into the library allows us to go get and vendor the tracer as any other Go dependency. Another important result of using the ELF loading mechanism is that the Scope container images are much smaller, as bcc and clang are not included and don’t add to the container image size. With go-bindata it’s possible to bundle the compiled BPF program into the Go binary to build a single fat binary that can be shipped and installed conveniently. A program of type TRACEPOINT can be attached to any Linux tracepoint. Tracepoints in Linux are “a hook to call a function (probe) that you can provide at runtime.” A list of available tracepoints can be obtained with find /sys/kernel/debug/tracing/events -type d.
Socket filtering is the mechanism used by tcpdump to retrieve packets matching an expression. With SOCKET_FILTER programs, we can filter data on a socket by attaching them with setsockopt(2). CGROUP_SOCK and CGROUP_SKB can be used to load and use programs specific to a cgroup. CGROUP_SOCK programs “run any time a process in the cgroup opens an AF_INET or AF_INET6 socket” and can be used to enable socket modifications. CGROUP_SKB programs are similar to SOCKET_FILTER and are executed for each network packet with the purpose of cgroup specific network filtering and accounting. We have setup continuous integration and written about how we use custom rkt stage1 images to test against various kernel versions. At the time of writing, gobpf has elementary tests to verify that programs and their sections can be loaded on kernel versions 4.4, 4.9 and 4.10 but no thorough testing of all functionality and features yet (e.g. perf map polling). With Linux 4.12, we have added a way to optionally specify the maximum number of active kretprobes to avoid probe misses. gobpf users can set the maxiumum with EnableKprobe(). gobpf/pkg now brings a couple of helper subpackages, for example bpffs to mount the BPF file system or cpuonline to detect all online CPUs. In closing, we’d like to thank all those who have contributed to gobpf. We look forward to merging more commits from contributors and seeing how others make use of gopbf. A special thanks goes to Weaveworks for funding the work from which gobpf was born. Continued contributions have been possible through other clients, for whom we are helping build products (WIP) that leverage gobpf. At Kinvolk we spend a lot of time working on and talking about the Linux userspace. We can regularly be found presenting our work at various events and discussing the details of our work with those who are interested. These events are usually either very generally about open source, or focused on a very specific technology, like containers, systemd, or ebpf. While these events are often awesome, and absolutely essential, they simply have a focus that is either too broad, or too specific. What we felt was missing was an event focused on the Linux userspace itself, and less on the projects and products built on top, or the kernel below. This is the focus of All Systems Go! and why we are excited to be a part of it. All Systems Go! is designed to be a community event. Tickets to All Systems Go! are affordable — starting at less than 30 EUR — and the event takes place during the weekend, making it more accessible to hobbyists and students. It’s also conveniently scheduled to fall between DockerCon EU in Copenhagen and Open Source Summit in Prague. While we’re happy to have this initial group of speakers, what’s really going to make All Systems Go! awesome are all the others in the community who submit their proposals and offer their perspectives and voices. Sponsors are crucial to open source community events. All Systems Go! is no different. In fact, sponsors are essential to keeping All Systems Go! an affordable and accessible event. We will soon be announcing our first round of sponsors. If your organization would like to be amongst that group please have a look at our sponsorship prospectus and get in touch. We’re looking forward to welcoming the Linux userspace community to Berlin. Hope to see you there! eBPF is a “bytecode virtual machine” in the Linux kernel that is used for tracing kernel functions, networking, performance analysis and more. Its roots lay in the Berkley Packet Filter (sometimes called LSF, Linux Socket Filtering), but as it supports more operations (e.g. BPF_CALL 0x80 /* eBPF only: function call */) and nowadays has much broader use than packet filtering on a socket, it’s called extended BPF. 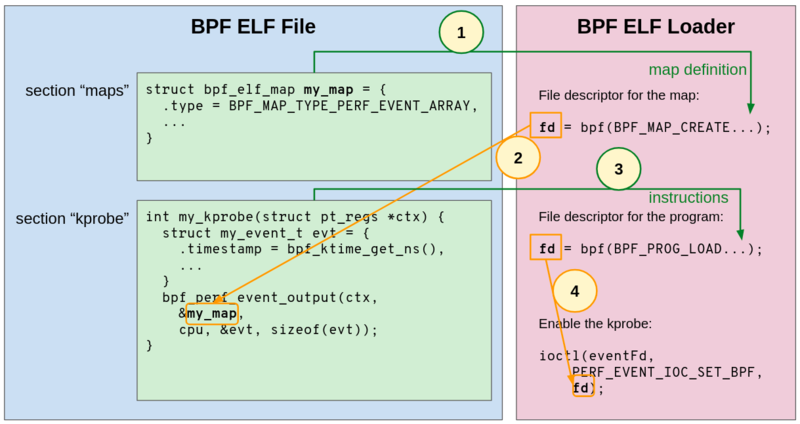 With the addition of the dedicated bpf() syscall in Linux 3.18, it became easier to perform the various eBPF operations. Further, the BPF compiler collection from the IO Visor Project and its libbpf provide a rich set of helper functions as well as Python bindings that make it more convenient to write eBPF powered tools. To get an idea of how eBPF looks, let’s take a peek at struct bpf_insn prog - a list of instructions in pseudo-assembly. Below we have a simple user-space C program to count the number of fchownat(2) calls. We use bpf_prog_load from libbpf to load the eBPF instructions as a kprobe and use bpf_attach_kprobe to attach it to the syscall. Now each time fchownat is called, the kernel executes the eBPF program. The program loads the map (more about maps later), increments the counter and exits. In the C program, we read the value from the map and print it every second. Nota bene: the increment in the example code is not atomic. In real code, we would have to use one map per CPU and aggregate the result. It is important to know that eBPF programs run directly in the kernel and that their invocation depends on the type. They are executed without change of context. As we have seen above, kprobes for example are triggered whenever the kernel executes a specified function. Thanks to clang and LLVM, it’s not necessary to actually write plain eBPF instructions. Modules can be written in C and use functions provided by libbpf (as we will see in the gobpf example below). A program of type BPF_PROG_TYPE_SOCKET_FILTER, for instance, receives a struct __sk_buff * as its first argument whereas it’s struct pt_regs * for programs of type BPF_PROG_TYPE_KPROBE. While BPF_MAP_TYPE_HASH and BPF_MAP_TYPE_ARRAY are generic maps for different types of data, BPF_MAP_TYPE_PROG_ARRAY is a special purpose array map. It holds file descriptors referring to other eBPF programs and can be used by an eBPF program to “replace its own program flow with the one from the program at the given program array slot”. The BPF_MAP_TYPE_PERF_EVENT_ARRAY map is for storing a data of type struct perf_event in a ring buffer. In the example above we used a map of type hash with a size of 1 to hold the call counter. In the context of the work we are doing on Weave Scope for Weaveworks, we have been working extensively with both eBPF and Go. As Scope is written in Go, it makes sense to use eBPF directly from Go. In looking at how to do this, we stumbled upon some code in the IO Visor Project that looked like a good starting point. After talking to the folks at the project, we decided to move this out into a dedicated repository: https://github.com/iovisor/gobpf gobpf is a Go library that leverages the bcc project to make working with eBPF programs from Go simple. You will notice that our eBPF program is written in C for this example. The bcc project uses clang to convert the code to eBPF instructions. We don’t have to interact with libbpf directly from our Go code, as gobpf implements a callback and makes sure we receive the data from our eBPF program through the chrootEventsChannel. To test the example, you can run it with sudo -E go run chrootsnoop.go and for instance execute any systemd unit with RootDirectory statement. A simple chroot ... also works, of course. With its growing capabilities, eBPF has become an indispensable tool for modern Linux system software. gobpf helps you to conveniently use libbpf functionality from Go. gobpf is in a very early stage, but usable. Input and contributions are very much welcome. This is part 2 of our “testing applications with traffic control series”. See part 1, testing degraded network scenarios with rkt, for detailed information about how traffic control works on Linux. In this installment we demonstrate how to test web services with traffic control on Kubernetes. We introduce tcd, a simple traffic control daemon developed by Kinvolk for this demo. Our demonstration system runs on Openshift 3, Red Hat’s Container Platform based on Kubernetes, and uses the excellent Weave Scope, an interactive container monitoring and visualization tool. We’ll be giving a live demonstration of this at the OpenShift Commons Briefing on May 26th, 2016. Please join us there. As discussed in part 1 of this series, tests generally run under optimal networking conditions. This means that standard testing procedures neglect a whole bevy of issues that can arise due to poor network conditions. Would it not be prudent to also test that your services perform satisfactorily when there is, for example, high packet loss, high latency, a slow rate of transmission, or a combination of those? We think so, and if you do too, please read on. Let’s now make things more concrete by using tcd in our Kubernetes cluster. To get started, we need to start an OpenShift ready VM to provide us our Kubernetes cluster. We’ll then create an OpenShift project and do some configuration. If you want to follow along, you can go to our demo repository which will guide you through installing and setting up things. The pieces Before diving into the traffic control demo, we want to give you a really quick overview of tcd, OpenShift and Weave Scope. tcd is a simple daemon that runs on each Kubernetes node and responds to API calls. tcd manipulates the traffic control settings of the pods using the tc command which we briefly mentioned in part 1. It’s decoupled from the service being tested, meaning you can stop and restart the daemon on a pod without affecting its connectivity. In this demo, it receives commands from buttons exposed in Weave Scope. OpenShift is Red Hat’s container platform that makes it simple to build, deploy, manage and secure containerized applications at scale on any cloud infrastructure, including Red Hat’s own hosted offering, OpenShift Dedicated. Version 3 of OpenShift uses Kubernetes under the hood to maintain cluster health and easily scale services. 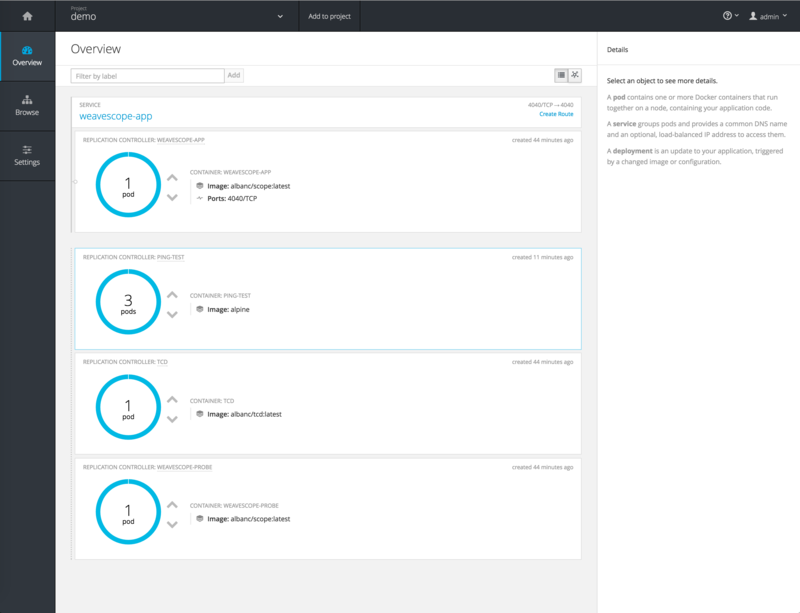 In the following figure, you see an example of the OpenShift dashboard with the running pods. Here we have 1 Weave Scope App pod, 3 ping test pods, 1 tcd pod, and one Weave Scope App. Using the arrow buttons one can scale the application up and down and the circle changes color depending on the status of the application (e.g. scaling, terminating, etc.). 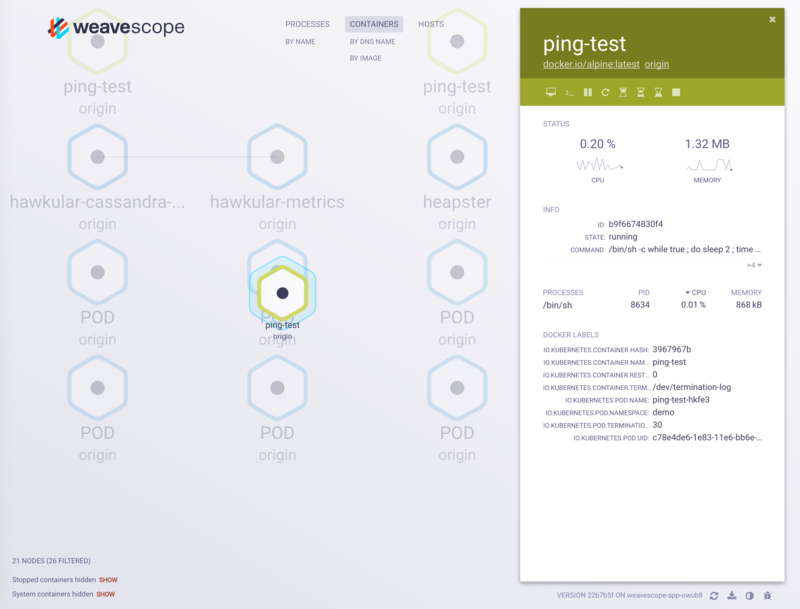 Weave Scope helps to intuitively understand, monitor, and control containerized applications. It visually represents pods and processes running on Kubernetes and allows one to drill into pods, showing information such as CPU & memory usage, running processes, etc. One can also stop, start, and interact with containerized applications directly through its UI. While this graphic shows Weave Scope displaying containers, we see at the top that we can also display information about processes and hosts. Now that we understand the individual pieces, let’s see how it all works together. Below is a diagram of our demo system. Here we have 2 Kubernetes nodes each running one instance of the tcd daemon. tcd can only manage the traffic control settings of pods local to the Kubernetes node on which it’s running, thus the need for one per node. On the right we see the Weave Scope app showing details for the selected pod; in this case, the one being pointed to by (4). In the red oval, we see the three buttons we’ve added to Scope app for this demo. 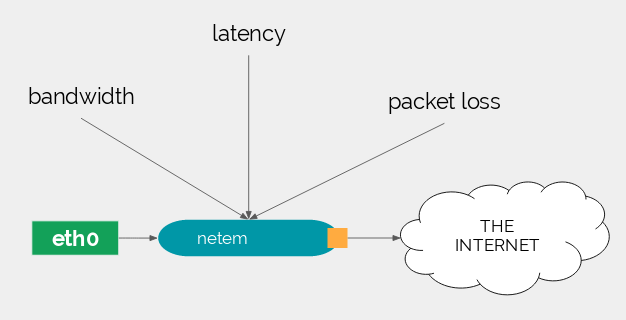 These set the network connectivity parameters of the selected pod’s egress traffic to a latency of 2000ms, 300ms, 1ms, respectively, from left to right. When clicked (1), the scope app sends a message (2) to the Weave Scope probe running on the selected pod’s Kubernetes node. The Weave Scope probe sends a gRPC message (3) to the tcd daemon, in this case a ConfigureEgressMethod message, running on its Kubernetes node telling it to configure the pods egress traffic (4) accordingly. While this demo only configures the latency, tcd can also be used to configure the bandwidth and the percentage of packet drop. As we saw in part 1, those parameters are features directly provided by the Linux netem queuing discipline. Being able to dynamically change the network characteristics for each pod, we can observe the behaviour of services during transitions as well as in steady state. Of course, by observe we mean test,which we’ll turn to now. Now for 2 short demos to show how traffic control can be used for testing. This is a contrived demo to show that the setup works and we can, in fact, manipulate the egress traffic characteristics of a pod. The following video shows a pod downloading a small file from Internet with the wget command, with the target host being the one for which we are adjusting the packet latency. It should be easy to see the affects that adjusting the latency has; with greater latency it takes longer to get a reply. We use the Kubernetes guestbook example for our next, more real-world, demo. Some small modifications have been made to provide user-feedback when the reply from the web server takes a long time, showing a “loading…” message. Generally, this type of thing goes untested because, as we mentioned in the introduction, our tests run under favorable networking conditions. Tools like Selenium and agouti allow for testing web applications in an automated way without manually interacting with a browser. For this demo we’ll be using agouti with its Chrome backend so that we can see the test run. In the following video we see this feature being automatically tested by a Go script using the Ginkgo testing framework and Gomega matcher library. With Kubernetes becoming a defacto building block of modern container platforms, we now have a basis on which to start integrating features in a standardized way that have long gone ignored. We think traffic control for testing, and other creative endeavors, is a good example of this. If you’re interested in moving this forward, we encourage you to take what we’ve started and run with it. And whether you just want to talk to us about this or you need professional support in your efforts, we’d be happy to talk to you. We’d like to thank Ilya & Tom from Weaveworks and Jorge & Ryan from Red Hat for helping us with some technical issues we ran into while setting up this demo. And a special thanks to Diane from the OpenShift project for helping coordinate the effort. The systemd project will be having its 2nd conference—systemd.conf—from Sept. 28th to Oct. 1st, once again at betahaus in Berlin. After the success of last year’s conference, we’re looking forward to having much of the systemd community in Berlin for a second consecutive year. As this year’s event takes place just before LinuxCon Europe, we’re expecting some new faces. As an active user and contributor to systemd, currently through our work on rkt, we’re interested in promoting systemd and helping provide a place for the systemd community to gather. Last year, Kinvolk helped with much of the organization. This year, we’re happy to be expanding our involvement to include handling the financial-side of the event. As feedback from last year’s post–conference survey showed, most attendees were pleased with the format. Thus, this year very little will change. The biggest difference is that we’re adding another room to accommodate a few more people and to facilitate impromptu breakout sessions. Some other small changes are that we’ll have warm lunches instead of sandwiches and we’ve dropped the speakers dinner as we felt it wasn’t in line with the goal of bringing all attendees together. A new addition to systemd.conf, is the workshop day. The audience for systemd.conf 2015 was predominantly systemd contributors and proficient users. This was very much expected and intended. As we expect a different audience for workshops than for the presentation and hackfest days, we will be issuing separate tickets. Tickets will become available once the call for participation opens. There are several ways you can help make systemd.conf 2016 a success. These events are only possible with the support of sponsors. In addition to helping the event be more awesome, your sponsorship allows us to bring more of the community together by sponsoring the attendance of those community member that need financial assistance to attend. See the systemd.conf 2016 website for how to become a sponsor. systemd.conf is only as good as the people who attend and the content they provide. In a few weeks we’ll be announcing the opening of the CfP. If you, or your organization, is doing interesting things with systemd, we encourage you to submit a proposal. If you want to spread your knowledge of systemd with others, please consider submitting a proposal for a workshop session. We’re excited about what this year’s event will bring and look forward to seeing you at systemd.conf 2016! Testing applications is important. Some even go as far as saying, “If it isn’t tested, it doesn’t work”. While that may have both a degree of truth and untruth to it, the rise of continuous integration (CI) and automated testing have shown that the software industry is taking testing seriously. However, there is at least one area of testing that is difficult to automate and, thus, hasn’t been adequately incorporated into testing scenarios: poor network connectivity. The typical testing process has the developer as the first line of defence. Developers usually work within reliable networking conditions. The developers then submit their code to a CI system which also runs tests under good networking conditions. Once the CI system goes green, internal testing is usually done; ship it! Nowhere in this process were scenarios tested where your application experiences degraded network conditions. If your internal tests don’t cover these scenarios then it’s your users who’ll be doing the testing. This is far from an ideal situation and goes against the “test early test often” mantra of CI; a bug will cost you more the later it’s caught. A video stream server The Real-Time Protocol (RTP) uses UDP packets. If some packets drop or arrive too late, it’s not a big deal; the video player will display a degraded video because of the missing packets but the stream will otherwise play just fine. Or, will it? So how can the developers of a video stream server test a scenario where 3% of packets are dropped or delayed? Applications like etcd or zookeeper implement a consensus protocol. They should be designed to handle a node disconnecting from the network and network splits. See the approach CoreOS takes for an example. It doesn’t take much imagination to come up with more, but these should be enough to make the point. What functionality does the Linux kernel provide to enable us to test these scenarios? Linux provides a means to shape both the egress traffic (emitted by a network interface) and to some extend the ingress traffic (received by a network interface). This is done by way of qdiscs, short for queuing disciplines. In essence, a qdisc is a packet scheduler. Using different qdiscs we can change the way packets are scheduled. qdiscs can have associated classes and filters. These all combine to let us delay, drop, or rate-limit packets, among a host of other things. A complete description is out of the scope of this blog post. For our purposes, we’ll just look at one qdisc called “netem”, short for network emulation. This will allow us to tweak the packet scheduling characteristics we want. Up to this point we haven’t even mentioned containers. That’s because the story is the same with regards to traffic control whether we’re talking about bare-metal servers, VMs or containers. Containers reside in their own network namespace, providing the container with a completely isolated network. Thus, the traffic between containers, or between a container and the host, can all be shaped in the same way. First, I start the video streaming server in a rkt pod. The server streams the Elephant Dreams movie to a media player via the RTP/RTSP protocol. RTSP uses a TCP connection to send commands to the server. Examples of commands are choosing the file to play or seeking to a point in the middle of the stream. RTP it what actually sends the video via UDP packets. Second, we start the GUI to dynamically change some parameters of the network emulator. What this does is connect to the rkt network namespace and change the egress qdisc using Linux’s tc command. Now we can adjust the values as we like. For example, when I add 5% packet loss, the quality is degraded but not interrupted. When I remove the packet loss, the video becomes clear again. When I add 10s latency in the network, the video freezes. Play the video to see this in action. What this shows us is that traffic control can be used effectively with containers to test applications - in this case a media server. The drawback to this approach is that it’s still manual. For automated testing we don’t want a GUI. Rather, we need a means of scripting various scenarios. In rkt we use CNI network plugins to configure the network. Interestingly, several plugins can be used together to defines several network interfaces. What I’d like to see is a plugin added that allows one to configure traffic control in the network namespace of the container. In order to integrate this into testing frameworks, the traffic control parameters should be dynamically adjustable, allowing for the scriptability mentioned above. In a coming blog post, we’ll show that this is not only interesting when using rkt as an isolated component. It’s more interesting when tested in a container orchestration system like Kubernetes. It’s not so easy to test new patches for systemd. Because systemd is the first process started on boot, the traditional way to test was to install the new version on your own computer and reboot. However, this approach is not practical because it makes the development cycle quite long: after writing a few lines of code, I don’t want to close all my applications and reboot. There is also a risk that my patch contains some bugs and if I install systemd on my development computer, it won’t boot. It would then take even more time to fix it. All of this probably just to test a few lines of code. This is of course not a new problem and systemd-nspawn was at first implemented in 2011 as a simple tool to test systemd in an isolated environment. During the years, systemd-nspawn grew in features and became more than a testing tool. Today, it is integrated with other components of the systemd project such as machinectl and it can pull container images or VM images, start them as systemd units. systemd-nspawn is also used as an internal component of the app container runtime, rkt. When developing rkt, I often need to test patches in systemd-nspawn or other components of the systemd project like systemd-machined. And since systemd-nspawn uses recent features of the Linux kernel that are still being developed (cgroups, user namespaces, etc. ), I also sometimes need to test a different kernel or a different machined. In this case, testing with systemd-nspawn does not help because I would still use the kernel installed on my computer and systemd-machined installed on my computer. I still don’t want to reboot nor do I want to install a non-stable kernel or non-stable systemd patches on my development computer. So today I am explaining how I am testing new kernels and new systemd with kvmtool and debootstrap. Why kvmtool? I want to be able to install systemd in my test environment easily with just a “make install”. I don’t want to have to prepare a testing image for each test but instead just use the same filesystem. The man page of systemd-nspawn explains how to install a minimal Fedora, Debian or Arch distribution in a directory with the dnf, debootstrap or pacstrap commands respectively. As you notice, I am installing systemd both in ~/distro-trees/fedora-22 and ~/distro-trees/fedora-22/fedora-tree. The first one is for the VM started by kvmtool, and the second is for the container started by systemd-nspawn inside the VM. I can easily test my systemd patches quickly with various versions of the kernel and various Linux distributions. I can also start systemd-nspawn inside lkvm if I want to test the interaction between systemd, systemd-machined and systemd-nspawn. All of this, without rebooting or installing any unstable software on my main computer. echo "Usage: test_kvm distro kernelver kernelparams"
echo "       test_kvm f22 4.3 systemd.unified_cgroup_hierarchy=1"
With this setup, I could test cgroup namespaces in systemd-nspawn with the kernel patches that are being reviewed upstream and my systemd patches without rebooting or installing them on my development computer.